Your entryway is one of your home’s most-used areas. And I’m not necessarily talking about just inside your front door. 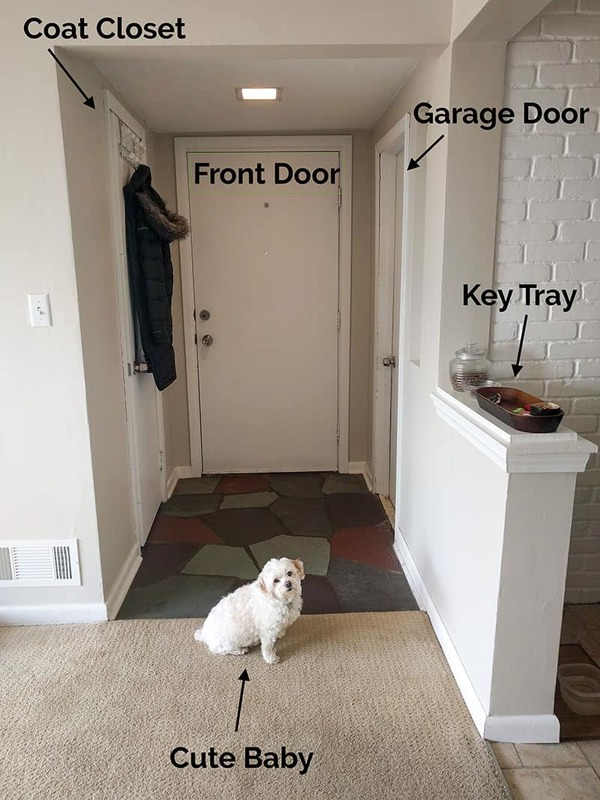 It’s the area where you enter your house most often — maybe from the garage or a side door. 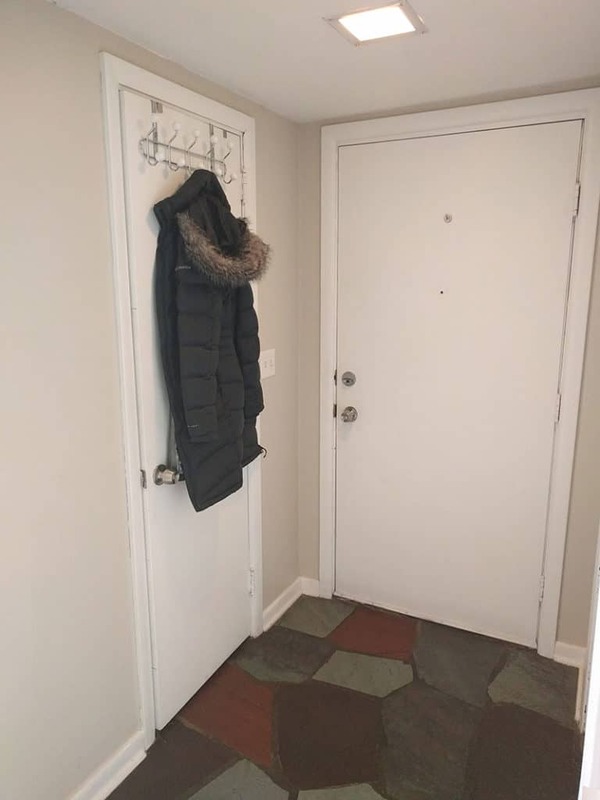 This entryway probably gets used by multiple people, multiple times per day; all wearing shoes and coats, and carrying purses, backpacks, grocery bags, and more. It’s a hard-working area of every house. If it’s not well-organized, it’s easily a disaster zone. 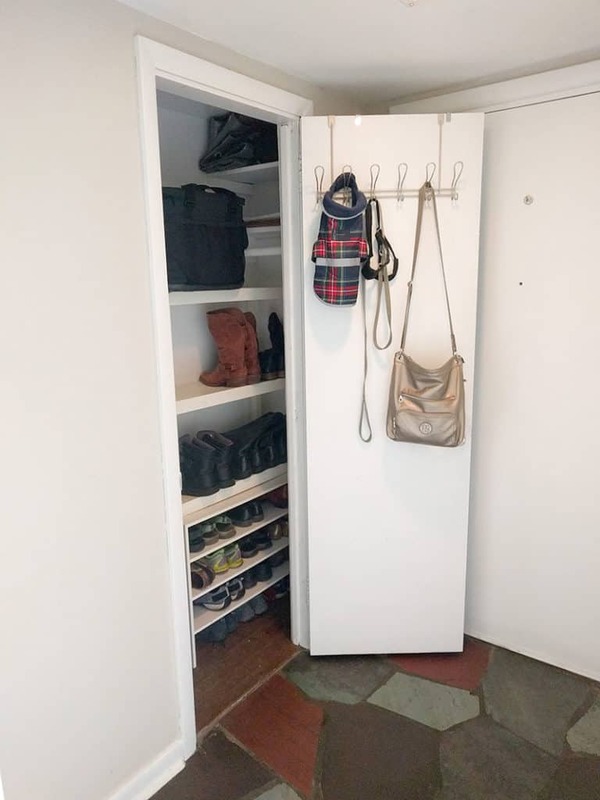 At our current house, we actually have a small coat closet right inside the garage door. This is super nice, though I still had to add a great deal of organization to make it functional. Our last house completely lacked an entryway. We had to get creative to make it work for us, so I know that frustration too. I’m going to share some of my favorite ways to organize an entryway and how we make the space work. 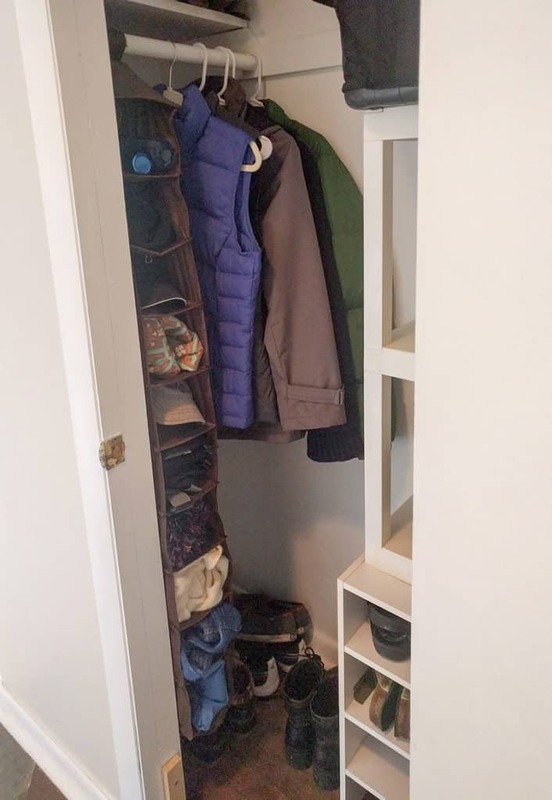 Most coat closets have a rod for hangers. It takes way more effort to hang a coat on a hanger than it does to hang it on a hook. This is one of those things where I try to make it easy for people to take care of their stuff so that it actually stays organized. In my experience, if there are only hangers available, coats end up on the floor. If there are hooks available, most coats and bags get hung up. We use hangers for coats that are off-season and won’t be needed for a few months. Coats in regular use get hung on hooks. At our first house, since there was no entryway, we hung hooks down the wall to the basement, which was right where you walked in the back door. Currently, since we have a real coat closet, we use over the door hooks. I have two of these, hanging in different directions so that we have hooks on the inside and outside of the door. If you have small children, consider hanging hooks at a lower height they can reach so that they can hang up their own coats and bags. In an effort to keep the bottom of the coat closet from turning into a mountain of shoes, we use a shoe rack to store most of our shoes. The pairs we are wearing most often usually sit on the floor of the closet or outside of the closet. The rest get put away on the shoe rack. 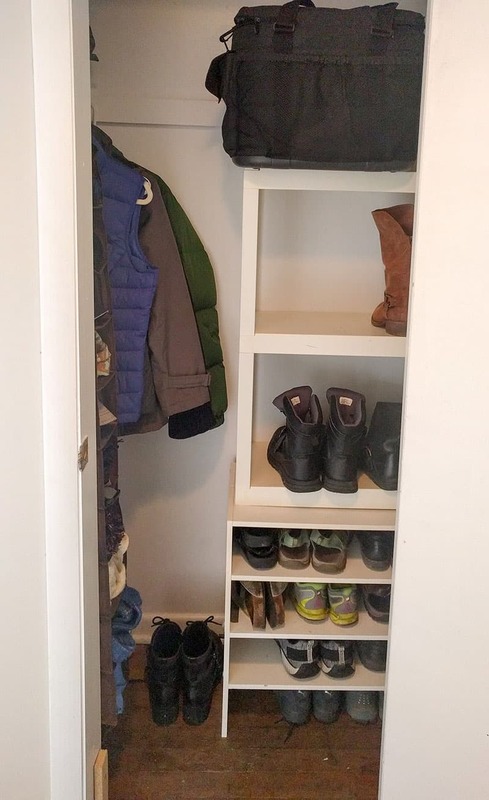 This helps utilize vertical place in the closet and keeps us from doing too much searching for the shoes we need. We also use larger shelves. Shoe racks are great for most shoes, but aren’t tall enough for boots. Boots get stored on the shelves. We also use shelf space for our cooler that we take to and from the grocery store, extra reusable bags, and a few other random things. Our hanging shoe organizer isn’t actually used for shoes. This is where we store hats, mittens, umbrellas, scarfs, and other outdoor accessories. The hanging organizer is a good use of vertical space. There isn’t room for a dresser or baskets nearby to put these things in, so it’s been a great solution. If you don’t need to use over the door hooks, it would also be great to use an over the door organizer with clear pockets for outdoor accessories. My main goal is to be able to find what we need quickly and to keep everything from accumulating in one giant pile. Hanging organizers help a ton. Since our very first tiny apartment, we have always had a key tray right inside the door. Nothing gets me rage-y more than needing to leave and not being able to find something as simple as the car keys. Austin and I are in the habit of putting the car keys in the tray immediately upon coming in the door. Austin also puts his wallet in the tray. It’s amazing to me how something so simple can make such a difference. Austin’s sister, who lives with us, has had trouble finding her keys quite often. She now tries to remember to put them in the tray which has equalled much fewer minutes of key-searching. 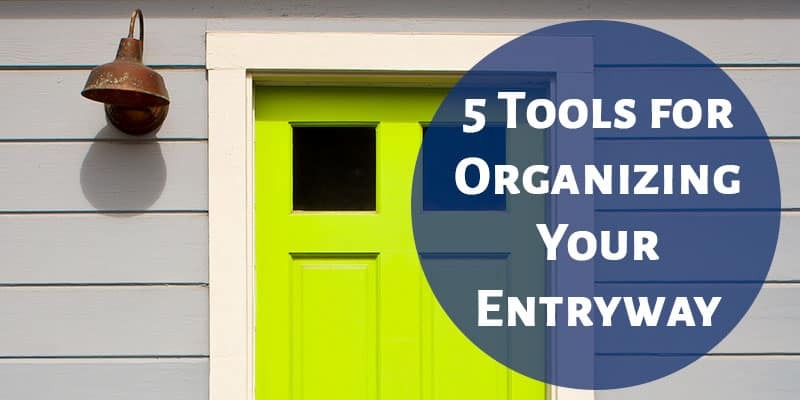 A disorganized entryway can mean tripping over shoes, constantly searching for your keys, and wasted time trying to leave the house every morning. 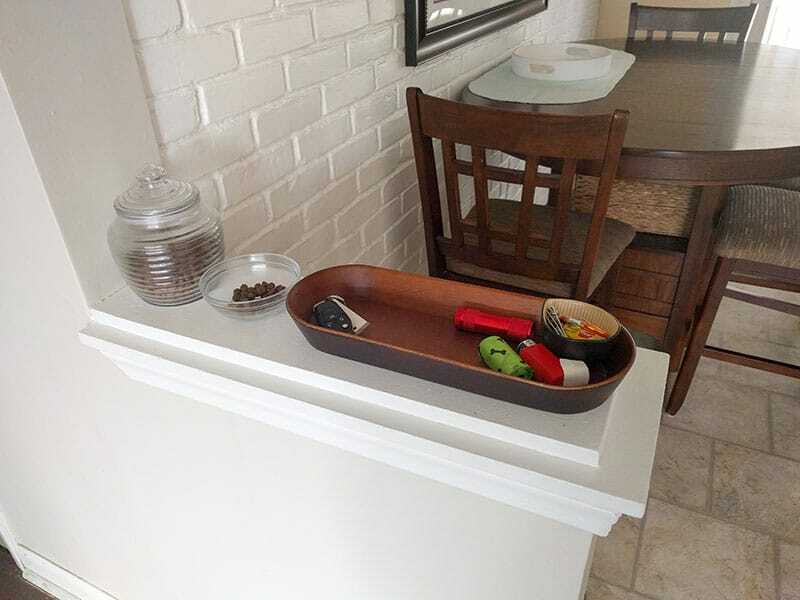 By using a variety of organizational tools, we keep our entryway in order and make it easy for everyone in the family to take care of their belongings. ⇒ What does your entryway look like? How do you keep it organized?